Injuries sidelined Halid and cost him an active life. 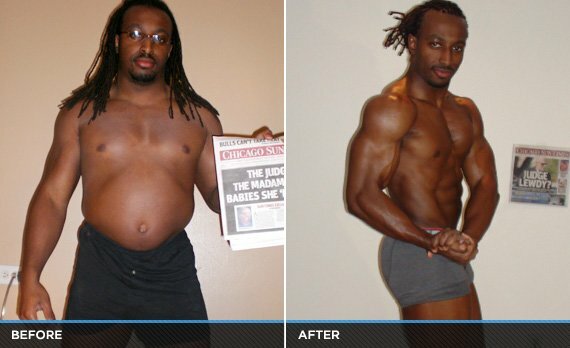 The 2012 Transformation Challenge inspired him to repair, recover, and take charge of his body! 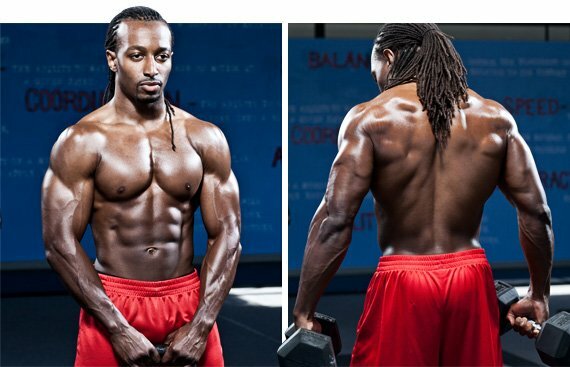 Halid Shokunbi is the male winner of the 2012 Optimum Nutrition $100,000 Transformation Challenge. His hard work delivered a cash reward and, more importantly, extreme physical results. Check out his story. Follow his full program. Next year, this feature could have your photo at the top! My fitness story started off like many others. I played a lot of sports pretty all my life, but about 4-5 years ago, I started taking weight training seriously. I ran into trouble when I started ignoring the minor aches and pains I began experiencing. Instead of resting and rehabbing, I made a mistake many people do: I worked through the pain. As a physical therapist, I knew better, but I loved lifting. After doing this for a few months, I reached a point where my body was just broken down. I had Achilles tendonitis, patellar tendinitis, minor hernia, shoulder sprain, partially torn triceps tendon, and a severe wrist sprain. Eventually I couldn't work out without pain, so, I stopped lifting. I stopped being active. I stopped caring about my diet. I was frustrated and defeated. I ate whatever I could get my hands on. Slowly but surely, I began gaining body fat. By the end of 2011, I reached a point where I couldn't deny that I was fat. I had a reputation of being fit and active. I was ashamed of what I had become. So, I decided to get in my best-ever shape. I wanted my transformation to be an example to others, showing them that you can make a change naturally and without extreme strategies. Mission accomplished! Supplements don't mean squat without hard training and great nutrition. When you nail those things, like Halid, supplements can help you push it even harder. Halid kept his inclination for spicy foods and addressed his guilty pleasures by reforming them into healthy alternatives! When Halid decided to take the Challenge, he hit the gym with extreme dedication. Follow his plan for great results! I chose to join because I was dissatisfied with my body and self-image. I wanted my transformation to inspire other people to live a fit lifestyle. The Transformation Challenge was extra incentive! I think I would have had close to the same success. Being in the Transformation BodyGroup gave me more motivation. Discussing the ups and downs of making a transformation with other people kept me from giving up. Seeing the success of other people in the challenge motivated me. I'm very competitive! My view of myself definitely changed. I realized I have an incredible amount of determination and drive inside of me. I never knew it existed. I figure, I'm just a regular dude, so if it it's inside of me, then it's inside of everyone. Additionally, this drive in all of us can be applied not only to fitness, but to other areas of life as well. I continue to live a fitness lifestyle. I try to educate and inspire other people to do the same. I'm still a physical therapist and I have started fitness modeling. I plan to compete onstage someday soon. Right now, life is great and the future looks even better!